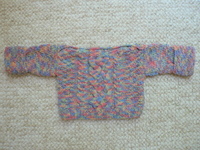 This pattern comes from the same pattern booklet as the Pink Kimono sweater - a Reynold's pattern. Overall, I like the sweater, but it did remind me of my own knitter bias: I just do not like variegated yarns as much as solid colors. Especially for cabled or otherwise texturally interesting patterns, because the yarn takes away from the intricacy of the knit (in my opinion). Workin' on the Pea Pod set - the body is done, and one sleeve is done - just one more sleeve (and a lot of blocking) to go!